Gibsonâ€™s radical Hawk series was another shortlived attempt to modernise Gibsonâ€™s image in the 1990s. It lasted from 1993 to 1998 and the series comprised 5 models. In the mid 1980s Gibson released new models that were nothing like previous ones to try and compete with new companies in the market. The Corvus (radical new shape, covered elsewhere on the site), Victory (Strat shaped), RD Artist (Firebird shape with complex active electronics) and M-III (superstrat, also on the site) were launched and all three were shortlived and relatively unsuccessful. Ten years later another such attempt to crack a new market was planned. This time Gibson played it slightly safer by using an updated version of the Les Paul shape, an iconic Gibson trademark. However, this body was less well-proportioned than Gibsonâ€™s original, and as such looked vaguely like a squashed Les Paul. This did the model no favours. The pickups were two stacked P-90s on the semi-acoustic Blueshawk, two standard humbuckers on the Hawk model, one standard and one slanted humbucker on the Nighthawk Standard, and the same on the Special and Custom Nighthawks, but with a single-coil in the middle position. 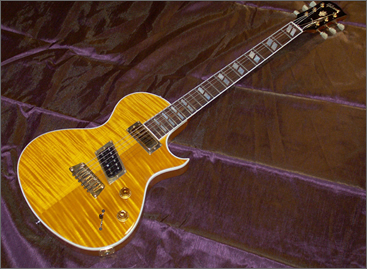 The Nighthawk Custom had a flamed maple top and a Floyd Rose tremolo. All the Nighthawks had a maple top and a mahogany body, the basic Hawk did not have this luxury, and the Blueshawk had a maple top and a chambered poplar body with f-holes. The guitars were unsuccessful and were unceremoniously dropped in 1999, apart from the Blueshawk which continued until 2006. Values now are available on the very good website www.blueshawk.info, from which I found that Blueshawks retailed for Â£792 new (price taken from 2002 catalogue) and are now worth about Â£550 for a good example. Nighthawks are similar in value but because of all the different models used prices vary.